Colorado is prized for its beautiful weather, including generous snowfalls. Drivers, and especially teenage drivers, should be mindful about driving safely on snow and ice covered roads. Many people die on Colorado's snowy mountain roads each year, but Colorado's traction laws are in place in an attempt to make those roads a little safer. Each of our driver's education locations covers how to drive safe in snowy conditions, along with everything else your teenage driver will need to know to get his or her driver's license. 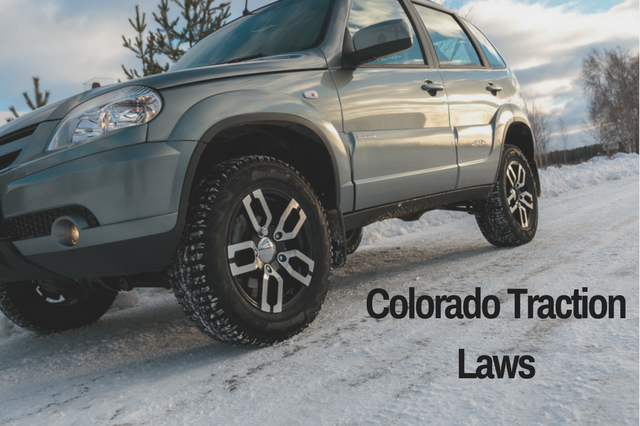 Colorado's traction laws help people's tires generate more friction on snow or ice covered roads. The laws were created by the Colorado Department of Transportation (CDOT), and must be followed or else the driver will recieve a fine. Here's what you need to know about these laws and associated fines by not complying. In times of inclement weather, CDOT will post signs about whether the Traction and Chain Laws are in effect. Drivers can also sign up for alerts to know about weather and highway conditions. Visitors to the state who are unfamiliar with these weather conditions should take some time to familiarize themselves with the laws. During snowy and/or icy conditions, CDOT issues an active Traction Law (Code 15) where drivers will need to have snow tires, tires with mud/snow (M+S) designation, or be driving a four-wheel/all-wheel drive vehicle. Adequate tires will have a minimum of 1/8th inch tread. All terrain tires are usually mud/snow tires, but it is a good idea to check to make sure. Mud/snow tires are designated as such by an M+S or snowflake icon on the tires sidewall. Chains can work as a substitute if tires are not enough for traction. Chains should be on the tires that are responsible for moving the car. Front wheel drive would have chains in the front and rear wheel drive cars would have chains in the back. During severe winter storms, CDOT will enforce a Passenger Vehicle Chain Law (Code 16), which is done before a highway is closed. During these periods, all vehicles on roadways must have chains or a suitable traction device such as AutoSock. During these times, drivers are advised to stay off the roads if possible. Violation of these laws is a safety hazard and CDOT can issue fines. These fines have been established to protect the safety of drivers and passengers on the road. According to the Colorado State Patrol, there are over 3,400 car accidents each year and near 300 crashes involve fatalities. These sobering statistics are a reminder that these laws are meant to ensure safer travel. Drivers who are cited for not having adequate tires or chains on the vehicle could face fines starting at $130. If a driver blocks the road because he or she is not driving with adequate equipment, they could be issues fines starting at $650. Can drivers avoid fines if the law is enacted when already out on the road? There is no leeway for drivers if they are caught in bad weather. Drivers can still be fined if weather conditions change and they are unprepared with adequate tires or chains. According to Colorado traction laws, drivers must get snow tires put on their vehicles or have chains or traction devices at all times. The best way to drive safe during winter weather storms in Colorado is to plan ahead. Make sure you've winterized your car, and are prepared in case you get stuck. One of the most important lessons that we teach in our driver's institutes locations in Parker, Littleton, and Grand Junction, is to be prepared for the drive before you go. Our instructors are all either active or retired police officers, and know how to stay safe on the road.